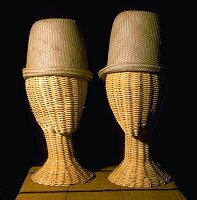 These hats are worn by the initiates who take part in Dipo. Dipo is a puberty rites ceremony of the Krobo which lasts for several days. At the conclusion of the ceremony, the girls' heads are shaved and the hats are placed on their heads. The hats are woven by old women who see the young girls through their initiation. These hats are not often available for purchase and these would be of interest to serious collectors of African art.